Moist, fluffy banana cake topped with creamy peanut butter frosting and filled with rich, chocolate fudge ganache! 4 ounces dark or semi-sweet chocolate best quality you can find! In a medium bowl whisk together flour, baking soda, and salt. Set aside. Using a stand mixer or handheld electric mixer on medium high cream the butter until fluffy, about 1 minute. Add sugar and continue to beat on medium until smooth, about 3 minutes. Beat in one egg at a time. Gently stir in yogurt and vanilla, then stir in bananas. Slowly add dry ingredients until just combined. Equally distribute batter between the 2 prepared cake pans. * Bake until toothpick comes out clean, about 20-25 minutes. Allow cakes to cool in pan for 10 minutes then cool completely on a wire rack. Once cakes are cooled completely make filling and frosting. FILLING: Chop the chocolate and place in a medium bowl. Heat cream in a sauce pan until hot to touch, no need to simmer. Pour cream over chocolate and stir until chocolate melts completely and blends with the cream. Stir in vanilla and salt. Cool until desired consistency is reached for cake filling, thick and fudgy but still spreadable. Spread ganache equally over the top of the bottom layer of the cake. Place other layer on top. FROSTING: Using a stand mixer or handheld electric mixer on medium high cream together butter and peanut butter until fluffy, about 3 minutes. Add vanilla and a pinch of salt. While mixer is on medium, gradually add powdered sugar until desired fluffiness is reached. 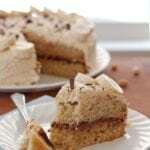 Frost cake and decorate with optional chocolate shavings, crushed peanuts and banana slices. Dig in! *I only own 1 round cake pan so I made all the batter, baked half of it in my prepared cake pan, and cooled the cake in the pan for 10 minutes (as directed). I then washed, re-greased, and re-floured the pan and repeated the process for the second half of the batter.